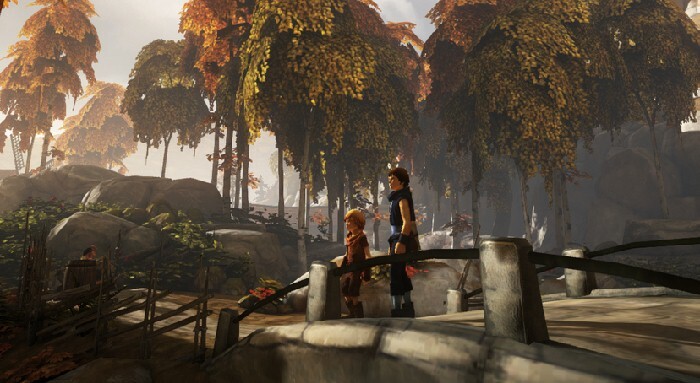 ‘Brothers’ is an adventure video game that works on a puzzle platform. It is a video game that owes a lot of its positive reception to the rich story line and plot involved in the game. In essence, the video game is about two brothers who have to journey to the Tree of Life (in their world) and bring back its magical waters in order to save their father’s life from a mortal illness. Naiee and Naia are two brothers who live in a village with their father. Naiee is the younger brother and Naia is the elder brother. Their mother died at sea in a timeline earlier to the one in the video game’s time. The opening scene shows the younger brother, Naiee, visiting the tomb stone of his mother. Then, his older brother Naia calls to Naiee for help. For their father is gravely ill and they need to take him to the village doctor. However, at the village doctor’s, the two brothers are informed that he, the doctor, can do nothing to help their father; the only that could possibly save the father now would be the waters of the Tree of Life. So thus, the brothers begin a perilous journey forth towards the Tree of Life in order to bring back its waters to cure their dying father. On their journey, they encounter many hurdles, such as a nasty dog, vicious and hungry wolves, and even cross (unfriendly) paths with the local bully in their village. All is not bleak though. For the brothers are a kind lot and they also help a lot of the people they meet on the way; they even help a pair of friendly troll find each other again, so needless to say, those attempts to help are not limited to the human characters alone. As they proceed forward on their journey, they soon reach an evil giant’s castle. There, they find and free a griffin. In thanks, the griffin helps the two boys. But sadly, it is so injured that it passes away due to its injuries soon after. Next, the two boys pass through a valley scattered with dead giants, and they save a girl who was going to be sacrificed by a tribe. The girl returns the favour by helping them cross the cold waters and avoid the dangerous fish in those waters. They three of them then reach a town which had been in the middle of a battle at some point of time before. However, during that battle, every person in the town suddenly froze in place and have remained in such a frozen death-like state ever since. The town isn’t entirely abandoned however, for there is an invisible giant still lurking in the town’s ruins. They defeat the monster though, and flee the town. After they flee the town, the young girl they had saved tries to seduce Naia, and she tricks both the boys to enter a cave, even though Naiee doesn’t want to. Inside the cave, the plot takes a turn and the girl reveals herself as a giant spider and tries to kill and eat the elder brother. The brothers kill her by pulling off her legs and escape, but Naia is injured in the process. And, finally reaching the place where the Tree of Life exists, Naia pushes Naiee to go to the top of the tree and collect the waters there himself, as Naia is too injured to go forward. And Naia does, finally collecting the waters of the magical tree for which they’d journeyed for.